Computers made our life simpler and better by storing, processing and computing things in a faster pace. We store, process loads of valuable data everyday for various needs. But the digital life is so uncertain. You can loose everything withing a few seconds. Be it a hacker attack or a computer hardware crash – your data consisting of years of work and sweat family memories are so fragile… Therefore its always a useful idea to make copies or backups. This may require you to buy more hard disk or online drive space but you will never have to regret for that. Copying files and folder from one location to another location is the basic way to create copies or backups, but its always useful and time-saving to make that job automatic. Backup softwares are coded for this purpose. With these you can update your backup once you made changes in the source location. Most of the time the options in Backup softwares are way too lengthy which common users tend to avoid. 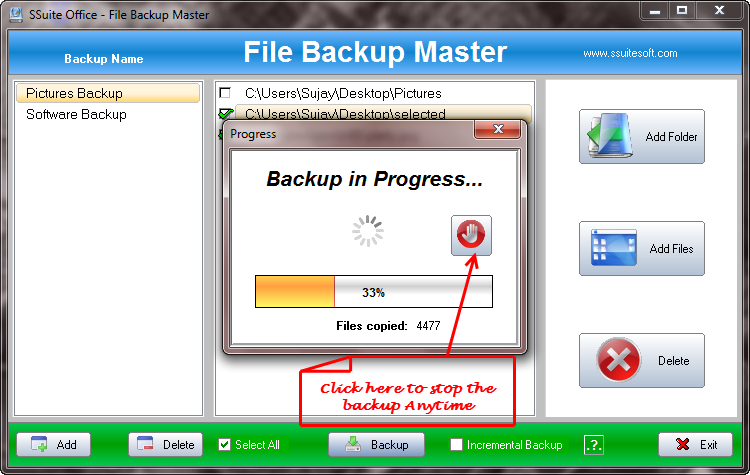 SSuite Office – Backup Master is a lifesaver software that makes the task of automating backup jobs easier and faster. The software is portable and offers easy options to create uncompressed backups from any number of folders and files to an external hard disk or to another PC in your network. The application runs on all Windows operating systems – 32 bit and 64 bit and in a 800 x 600 display size. The application may be launched by executing FileBackup.exe. Windows Vista / 7 / 8 users may need to run the software as administrator for successful operation. Software usage is easy. A short help manual is provided with the application. 1. 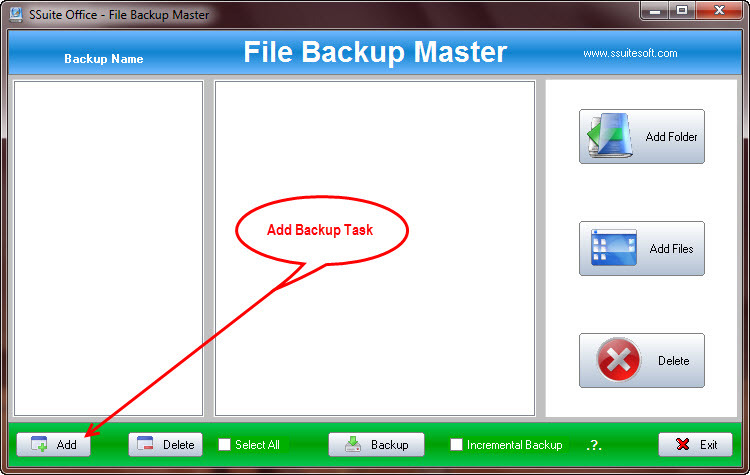 Launch the application, click on Add button for creating a backup task. 2. Add a description to the backup and also set the backup location, either by typing the address or by browsing. Click on Save to save the backup task. You can add multiple backup tasks. As the backup location you can choose any of the local disks, any of the attached external hard disks or a shared folder on a PC within your network. Double click anytime in the backup task to edit it. 3. 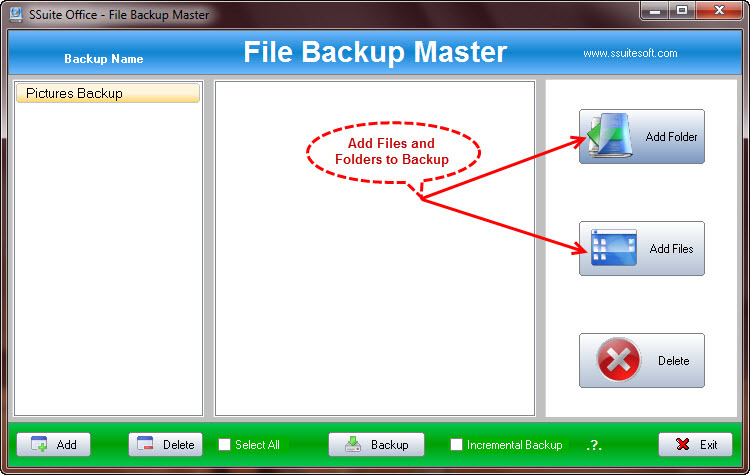 Select a backup tasks and add the source files and folders. 4. 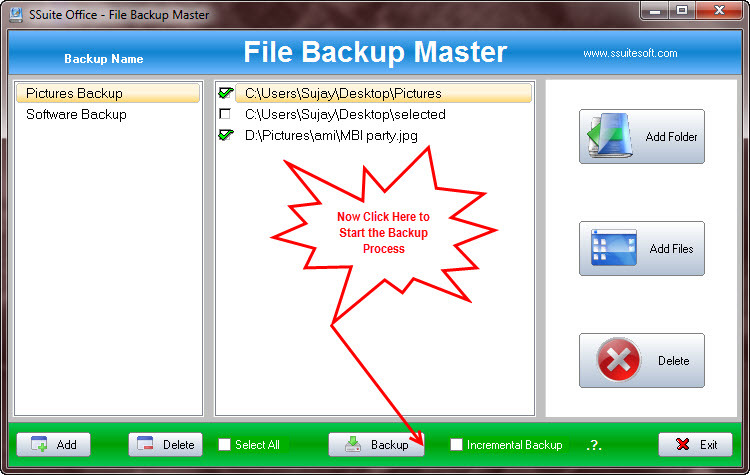 Select the added files and folders in a particular backup task and click on Backup to launch the backup process. You can even place a check mark on the Select All to select all the added files and folders. If you had done the backup before and only want to run the backup for new and modified files, place a check mark on Incremental Backup. 5. Backup process runs smooth and fast without much resource usage. You can cancel the backup process anytime. 6. At backup end, it will show the progress bat at 100% and then closes the progress window. The backup tasks are saved as files Category.cds and Path.cds in the same directory as the executable. Any amount of folders and files can be chosen for backup. Backup to any of the Local Drives, Connected External Drives and Networked Computers. Low system resource usage both during idle time and backup process. No requirement for Java or .Net Framework! Cannot run more than one Backup task! Cannot backup in a compressed format! I am one of such users who hate to do customizations in a backup software. That’s why I commonly choose to use copy-paste for backup purpose. But I will continue using this software since it has a very useful feature – incremental backup and also has no complex settings. The last two points mentioned in the disadvantages is actually a advantage for me and many others who prefer simple applications. The first two points, I think is a must. I found a few bugs in the software, not all are bugs but features that should be there for better software experience. While adding backup location it calls Windows browse function, but that does not have Add New Folder option. Attempt to view another backup task, deselects the file and folder selection of current task, even if Select All option is activated. The progress bar is buggy. It only shows 33% completion for a moment at the end of backup progress. All other times there are no progress percentage. After backup finish, the file & folder selection gets deselected even if Select All option is activated. I would recommend the software as an ideal alternative of copy-paste backup!! Enjoy !! This entry was posted in Backup, File Management, Free, OS Enhancement, Portable, Security Related, Software, Windows. Even if a particular Folder/file is selected in which to backup data (to a External Hard Disc), increments in a file (additional notes etc) or modifications are not backed up. But the message says 100% backup completed. What is the hitch? Am I missing a step? Would be thankful for a clarification. There is an “Incremental Backup” selection on the bottom of the window that needs to be selected to backup modifications. I learn a lot from your post.There is a lot of very useful knowledge in your post.I enjoy reading it and hope to see more.